Art Primo: Blog - Football Season is Here! Well football heads, the 2009/2010 Football season is here. The first pre-season games have already been played and tickets are selling out left and right. 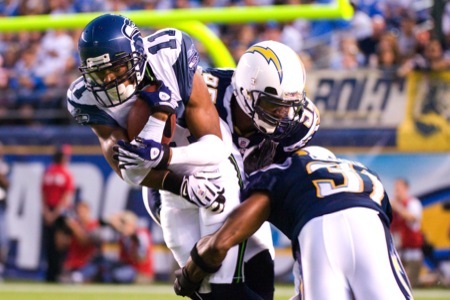 For Seattle Seahawks fans the August 15th game was a complete success, their win against the San Diego Chargers was a great way to kick off the season. The 20-14 win had tons of great plays, surprisingly mostly by Jon Ryan the Seahawks punter. He averaged 52.4 yards on eight punts, including a 77-yarder in the fourth quarter. His net average of 41.1 yards would have been even better if two of his punts hadnâ€™t skipped into the end zone for touchbacks. The next pre-season game on August 22nd will be against the Denver Broncos at home here at the Qwest stadium in Seattle, who sadly beat the San Francisco 49ers in their first pre-season game. Stay tuned for all of your football updates here on the Art Primo Blog. Home » Art Primo: Blog » Football Season is Here!